Their protest is now firmly established at Pearl Square, where tents have been erected and basic amenities installed to cope with the thousands who now camp there nightly. In deliberate replication of the demonstrations at Tahrir Square in Egypt’s capital, Cairo, the protesters in Bahrain are saying that they are not moving until their demands are met. Men, women and children have lost their fear. After a brutal crackdown by the state last week, which resulted in seven civilians murdered and hundreds injured, failed to crush the uprising, the people are now increasingly emboldened and determined to demand the overthrow of the Al Khalifa regime. People have found their voice to demand what they have been wanting for many decades – for, what they see, as an imposter regime to go; to get out of their lives and their island. Bahrainis have long memories regarding the nature and origin of the regime. Over and over, the protesters will tell you that they have had enough of the Al Khalifas’ predatory rule. One small, makeshift placard held by a group of young teenagers said in Arabic: “The visit is over”. Many indigenous Bahrainis (about 600,000 of the total one million present population) can trace their family origins back to the time of “Prophet Issa” (Jesus) and beyond. They view the ruling Al Khalifa family as something of an imposter that has abused the civility of the Bahraini people for the past 200 years. It is not a gross oversimplification of history when Bahrainis relate how the Al Khalifas originated from a Bedouin tribe in what became central Saudi Arabia and voyaged around the Persian Gulf as pirates and renegades seeking a base. After being kicked out of Zubarah (later Qatar), the Al Khalifas settled in Bahrain. With the help of the British Empire, they became rulers of the island in return for British “protection”. 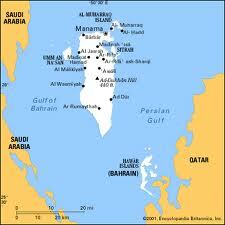 Bahrain, as an ancient trading hub, bestowed on the indigenous people a certain cosmopolitan, civilized attitude. They were fishermen, farmers, boat makers and artisans who were able to make a good living from the island’s rich natural resources, which included abundant freshwater aquifers. Their new masters and their rapacious way of existence, plus crucial British material and political support, made short work of these people’s natural hospitality to install a dynasty that has bled the island dry. The present prime minister, and uncle of the king, has been in office for 40 years since the country gained nominal independence from Britain in 1971. The prime minister personally owns many of the skyscraper properties that have sprung up in Manama’s financial district, including the twin towers of the Financial Harbour. Among the protesters last night, one rather dishevelled Bahraini man, about 45-years old, explained how Bahrain’s modern land reclamation projects have destroyed vast swathes of coastline and indigenous livelihoods to create areas such as the financial district of Manama that attract international capital and enrich the Al Khalifas. The same story is recounted by many other ordinary Bahrainis who have watched their country’s resources of fishing, pearling, farming, and latterly oil, being depleted to enrich a ruling elite that comprises 50-100 individuals. But after decades of exploitation, Bahrainis seem to have finally lost their tolerance of these “pirates” thieving off them, imprisoning them, torturing them, killing them, stealing their beaches and their natural resources – all with the full support of Britain and latterly the US government – with its Fifth Fleet moored here. The final line crossed was when the regime ordered the army last week to shoot unarmed civilians who were simply asking for a fair share of their own country. The bloodshed has only made more people come out en masse and more determined. There were many young mothers with their children among the demonstrators. All were saying that they have come out to fight for their children’s future. These are the kind of objective, desperate conditions that are coming to all countries enslaved under global capitalism, including the US and Europe. When the mass of people stsrt to realise that their lives and the lives of their children are being denied by a system of elite parasitism (capitalism), then they will find the necessary militant intolerance towards the system – such as we are beginning to see in the US state of Wisconsin. It comes down to a very basic conflict of material interests: your elite undue wealth is stopping me and my people feeding our children. That is a hugely powerful driver behind the uprising in Bahrain and elsewhere across this region. It’s what makes history, events and, ultimately, change happen. More than ever, it can be seen how Karl Marx is so right about how all of modern history stems from the history of class struggle. A lot of ordinary people may not yet put it exactly like that, but that’s what it gets down to. But it is not enough to just stand up to the elites and kick them out. There is a need to know what to replace their system with. We need to be able to analyse and articulate what we want, otherwise vacuum sets in and the elites can reconfigure, dissipate and distract the mass of disaffected people. Calls by the elites in Bahrain and elsewhere for “national dialogue” – with the belated blessing of Washington, London, Paris etc – is no doubt a hurried attempt to repackage and retrench the regime. Without some kind of awareness of alternative, there is the danger of the momentum being dissipated and the opportunity for a socialist solution being lost. Among the Bahraini protesters, the demands are so far largely described in terms of admirable values: democracy, freedom, human rights, equality. But time is of the essence to begin articulating an organized social, political, economic programme in order to realize their aspirations and needs. In Bahrain, of the seven deaths over the past week, there is a horrific picture of one of the victims who was shot at close range while he slept at the protest camp at Pearl Square last Thursday when the state did its worst to crush the movement. The photo has become a poster being held up by many demonstrators. It shows the bloodied face of a man whose skull is blown off. It’s grotesque and people aren’t being ghoulish about it either (we can imagine how Fox News would try to twist into Arab/Islamic bloodlust). The picture is being displayed to simply show the heinous reality of this regime and its Western capitalist masters, and what that regime has for so long taken off these people and what it is prepared to do in order to keep taking off the people.